Rarely have more humorous paintings been produced than in the Dutch Golden Age. Naughty children, stupid peasants, foolish dandies and befuddled drunks, quack doctors, pimps, procuresses, lazy maids and lusty ladies – they figure in large numbers in Golden Age masterpieces. 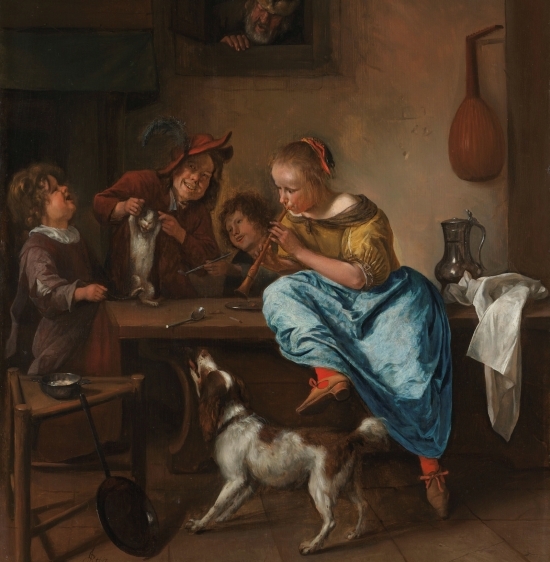 The Art of Laughter: Humour in the Golden Age presents the first ever overview of humour in seventeenth- century painting. The exhibition runs to 18 March 2018 in the Frans Hals Museum. A catalogue is being published to coincide with The Art of Laughter: Humour in the Golden Age with contributions by the curators of the exhibition, Anna Tummers, Curator of Old Masters at the Frans Hals Museum | De Hallen Haarlem, Jasper Hillegers, Assistant Curator of Old Masters, Elmer Kolfin, lecturer at the University of Amsterdam and Mariët Westermann, Golden Age specialist and Vice-President of the Andrew W. Mellon Foundation. The catalogue is being published by Uitgeverij Waanders. The Art of Laughter: Humour in the Golden Age is made possible in part by the Bank- Giro Loterij, VSBfonds, Fonds 21, Prins Bernhard Cultuurfonds, Dr. Hendrik Muller’s Vaderlandsch Fonds, Friends of the Frans Hals Museum | De Hallen Haarlem and the Government of the Netherlands: The Cultural Agency of the Netherlands granted an indemnity guarantee on behalf of the Minister of Education, Culture and Science.